For those that are struggling to develop thriving tree swallow and bluebird populations in their hosta gardens and yards, I have some thoughts on how to reverse this problem. This is certainly not the final solution, but the answer to why you need to help them to be successful in today’s environment. Prior to the settling of the colonists, the beavers were making dams, killing off the trees behind the dams, and providing perfect nesting areas for hole-dwelling birds like the tree swallow or bluebird. Protection from predators was given by the water surrounding a tree, which acted as a moat that kept them from reaching the nests. For those of you who have seen the recent expansion of the beavers, you will see this happening in its natural process. So what does this mean for homeowners, who obviously do not have beaver dams on their properties? 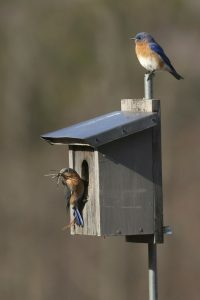 The protective living situation that these birds existed within must be mimicked in order to prevent the predator from climbing your birdhouse bearing pole or tree. Installing an obstruction of your choice will provide this protection. There are physical obstructions like cones, sticky feet, and a myriad of other barriers and deterrents that can be used. These options can be further explored by doing some of your own research. Find a method that works for you to prevent mostly nocturnal predators from climbing the pole to eat the eggs or the babies; or, in the case of squirrels, to occupy the nest box for themselves.